Since its opening in 1929, the Ritz Theatre has been a rich source of culture, music, and entertainment for Corpus Christi. During its 57 years of operation, the Ritz transformed from a first-rate vaudeville house and movie theatre, into a rock-concert venue, and, later, reemerged as a community theatre. Audiences flocked to the Ritz for the atmosphere the beautiful theatre provided. The luxurious interior appealed to locals escaping the harsh realities of the Great Depression, military personnel stationed in Corpus Christi before being shipped off to fight in WWII, and later to teenagers who experienced their first rock concerts there as the city slowly rebuilt itself after Hurricane Celia. The Ritz Theatre has been closed for over 20 years, and has slowly deteriorated due to neglect and vandalism. The roof has suffered significant damage. The ceiling, once painted and illuminated like a night sky, is now crumbling with visible signs of mold. A major water leak over the theatre balcony has destroyed several rows of seating. Restoring the Ritz Theatre will not only ensure the preservation of a significant example of 1920s classical movie palace, but will also revitalize a struggling downtown through economic growth and cultural programming, renew the community’s investment in preserving its cultural history, and ensure that the Ritz Theatre will remain a landmark for entertainment for future generations. 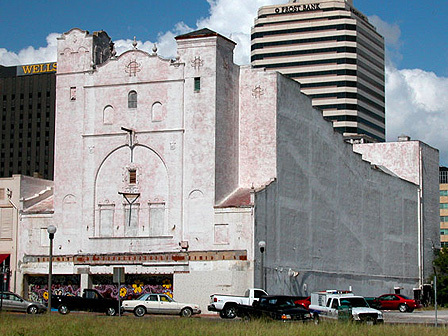 UPDATE (June 2014): Corpus Christi PATCH is dedicated to the restoration of the Ritz Theatre. Learn more about them on their website and on Facebook.